Cheesecake is a classic dessert that’s loved by many and is a joy to eat any day. 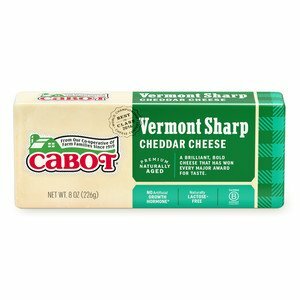 This cheddar cheesecake recipe takes the traditional recipe and brings it up a few notches with an amazing combination of Cabot Vermont Premium Cream Cheese and Cabot Sharp Cheddar Cheese, in addition to a scrumptious topping of candied apple slices. While this recipe deserves a spot on any dessert table for the most special of occasions, it’s easy enough to make and enjoy even on a regular day. Make this candy apple cheesecake for your next celebration or just as a special treat for your family. Be sure to share the recipe with family and friends on Facebook, Pinterest, Instagram, and Twitter. To make the cheddar cheesecake, preheat your oven to 475°F. Transfer the graham cracker crumbs to a bowl and add ¼ cup sugar and melted Cabot Unsalted Butter and stir until well combined. Line the bottom of a 9-inch spring form pan with parchment or wax paper, cut to fit. Press the crumb mixture firmly and evenly over the bottom of the pan and slightly up the sides. 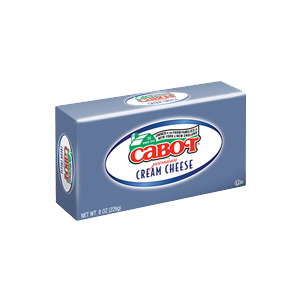 Place Cabot Cream Cheese in an ovenproof bowl and put in the oven for about 1 minute, or just until softened. Beat in eggs one at a time until mixture is fluffy, then add remaining sugar, lowfat milk (or half-and-half), fresh lemon or lime juice and flour and beat well. Pour mixture into the crust-lined pan and bake for 10 minutes. Reduce oven temperature to 200°F and bake for 1 hour longer. Turn off the oven and let cheesecake sit in oven for 1 additional hour. Top with Candied Apple Slices or a simple chocolate ganache (see chocolate ganache recipe below). 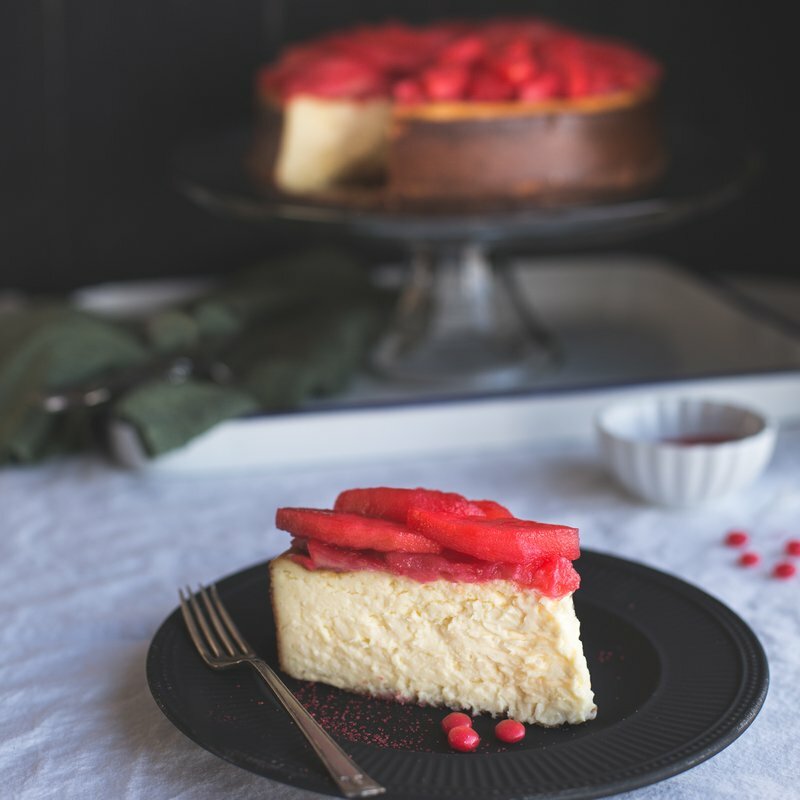 Need another fabulous cheesecake recipe? Our Vanilla Bean Cheesecake will win you over immediately! 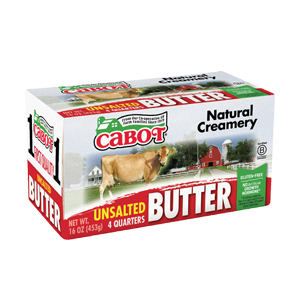 As a co-operative of over 800 farm families, Cabot takes a lot of pride in making our award-winning dairy products. We’d love to hear your thoughts on this cheddar apple cheesecake recipe, so please rate and review it once you’ve tried it. TRANSFER to bowl and add ¼ cup sugar and melted butter; stir until well combined. LINE bottom of 9-inch springform pan with parchment or wax paper, cut to fit. Press crumb mixture firmly and evenly over bottom of pan and slightly up sides. PLACE cream cheese in ovenproof bowl and place in oven for about 1 minute or just until softened. BEAT in eggs one at a time until mixture is fluffy. Add remaining ingredients and beat well. POUR mixture into crust-lined pan. BAKE for 10 minutes. Reduce oven temperature to 200°F and bake for 1 hour longer. TURN off oven and let cheesecake sit in oven for 1 additional hour. PLACE the chocolate in a medium sized glass bowl. Bring the heavy cream to a boil in a separate pan and immediately pour over the chocolate in the bowl. WHISK or stir the chocolate and cream until it is very smooth and shiny. If using a liqueur, stir it in. Allow the ganache to cool for about 10 minutes before using as a glaze. POUR, when ready and spread over the entire surface of the cheesecake using a spoon or spatula to make it as smooth as possible. Recipe courtesy of Cabot Creamery Co-operative. Photo courtesy of Caroline Hurley.